Simple yet sophisticated, the classic Shaker style offers clean, straight lines with flat panels that naturally lends itself to a range of different decor - from antique to modern, our Deluxe Double Dresser will make a statement in any bedroom suite. Crafted by hand, from pieces of premium North American hardwood, this dresser offers warmth and beauty that will last a lifetime. The main case features large flat sides and a flat front that holds seven spacious drawers that are perfect for keeping all your bedroom items neat and tidy. Each drawer box is mounted using smooth ball-bearing slides that offer full-extension away from the case piece, giving you access to everything stored inside. Along with this, a soft-close mechanism is provided to ensure your drawers never slam against the frame or remain slightly ajar to injure a leg or knee as you pass by. 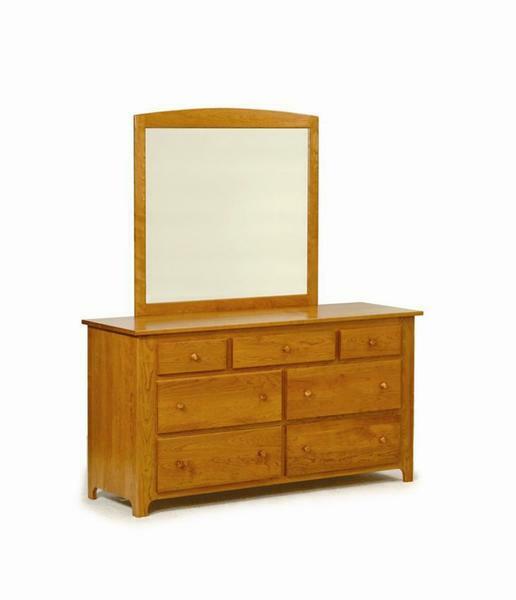 The optional matching mirror (as shown) is cased in the same beautiful hardwood and mounts to the back of the dresser - completing the look of the dresser while offering a convenient way to make sure you're looking great as you head out to face the day. Customize this piece to complement the rest of your suite by choosing from an array of hardwood and finish options to get just the right combination. The classic Shaker knobs are standard, but please call one of our Furniture Specialists today to select a different hardware or request a custom quote to tailor this piece to fit your space. We also have stain samples available to help you narrow down you decision and would be happy to help you start your order by phone. Toll-Free (866) 272-6773.